This how-to guide is designed to get you quickly up to speed on the key principles of Agile Marketing and provide resources to get started. At the end, there are links to practical tools & templates you can download. If you're looking for an Agile platform, sign up for a free 30-day trial, and collaborate with your team using Kanban boards and project calendars. Agile Marketing is a powerful and proven tactical approach to improve the processes that empower your marketing team, encouraging constant and swift growth. An Agile approach allows teams to be more capable to adapt to real-time marketing challenges or opportunities. Not only does the Agile process improve a teams speed, but it encourages transparency and rewards adaptability, ultimately leading to happier and less stressed team members and more consistent results. In an Agile Marketing process, the team discovers and then focuses their collective efforts on the projects that matter most; completing these together cooperatively. The goal with Agile Marketing is to continuously and incrementally improve over time, and consistently measure the impact completed projects provide. Agile Marketing is based on the Agile approach to project management often used in software development to encourage programmers to focus on incremental progress over building bigger projects, that take longer to complete, and may be irrelevant or unnecessary after they are completed. By focusing on projects incrementally, the results are available much quicker, allowing the teams to test and analyze the outcomes before investing more resources in that area. This approach has been so successful helping teams get faster and more efficient that the Marketing world has begun implementing it on marketing related projects, with equally great results. Keeping with the concept behind Agile Marketing, this How-To Guide is designed to be a quick and rapid review of the concept, how it works, and how you can leverage this powerful methodology with your marketing team. During a conference on Agile Marketing, the attendees were asked to compile and vote on a manifesto that covers what Agile Marketing is all about. The following list has become a popular manifesto for the Agile Marketing world. Our highest priority is to satisfy the customer through early and continuous delivery of marketing that solves problems. Great marketing requires close alignment with the business people, sales and development. Although these principles and manifesto are simply suggestions by experts in the field, and are not a standard definition, they serve as a powerful reminder on what Agile Marketing is about, and what it is trying to achieve; Marketing efficiency. Before we review how Agile Marketing works, please review this glossary of terms to begin to become familiar with the terminology used when working with an Agile management process. Sprint: A specific length of time in which a team commits to complete a project. Sprint Burn Down: A daily progress tracking chart for the duration of the sprint. Sprint Backlog: A prioritized list of responsibilities to be achieved during a sprint. Product Backlog: A list of features/tasks that the team will add to future sprints. Task or User Story: Description of desired outcome from stakeholders perspective. Success Criteria: What must be achieved to declare a task complete. Story Points: An estimated amount of effort a specific amount of work will take. Point Scale: Point system describing the difficulty of a task, instead of using hours. Blocker: Something that is preventing the teams efficiency. Sprint Review: Team meeting where successes/lessons are shared from last sprint. Standup or Scrum: Team meets about yesterdays work, todays plans and ‘blockers’. Scrum master: The person responsible for sprint planning, reviews and meetings. 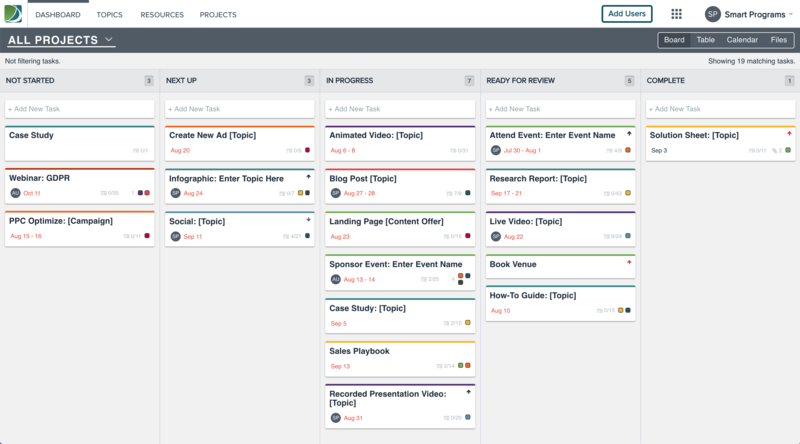 Kanban: A highly adaptable productivity approach for visually planning as a team. In Agile Marketing, teams use Sprints (which are short focused periods of defined work) to get things done. These Sprints are planned as a team, and consist of multiple tasks (also known as User Stories) which are required to be completed for the Sprint to be successful. The entire team must work together to help each other achieve a successful end result for every Sprint. This means collaborating with other team members who may be focusing and ‘owning’ a specific task or user story, to help them achieve the results required. Failure of a Sprint is the entire teams responsibility. Sprints are usually 1-4 weeks long, and anything that is too large of a project will get broken down into smaller more digestible chunks, over the course of several Sprints. The concept of Sprints comes directly from a popular methodology known as SCRUM. The SCRUM process itself is continuous. It starts with sprint planning, which takes tasks, or user stories, from the product backlog, and places them into the Sprint backlog. Over the course of the Sprint, tasks are achieved which incrementally improves the project (or in many cases a piece of software), and with daily Standup meetings to ensure collaboration. After each Sprint, the team measures impact both good and bad and does a Sprint Review and Retrospective, to ensure mistakes are not repeated. Agile embraces failure as part of the learning process, and leverages these insights in the next Sprint. Although Agile Marketing focuses on all roles, titles and seniority to be removed from the working environment, there is still a level of hierarchy required for proper organization. Product Owners: Maintain backlog and represent stakeholder interests. Product Teams: Self-managing groups of people who develop the product. Depending on how many teams you have, or consecutive products (otherwise known as projects) are being focused on, it can be helpful to have a higher level individual that manages the entire Agile/Scrum process often known as the ‘Scrum Master’. The Agile Marketing process begins with defining all of the projects your team wants (or needs) to work on. This requires defining the work required and placing it in a Product Backlog, which represents all of the projects and tasks you plan on working on in the near future. The goal of each Sprint is to take items from that Product Backlog, and then place them into the Sprint Backlog to be completed within the time defined for that specific Sprint, in short iterations. Your team must develop a backlog of tasks (also known as User Stories) that describe the work in context to the stakeholders involved. A Story should be a small piece of work that can be written in context to the person doing the work itself. Truth be told, if the person working on the task cannot answer why they are doing the task, or define what will make the task successful, they really shouldn’t be working on it at all. Ultimately, the goal of any Agile Marketing team is to prioritize stories based on their importance to the organization, and then estimate how difficult the task will be using story points (instead of hours). Each Sprint can last from 1-4 weeks depending on what the Product Owner, or Scrum master decides. During that time each member of the team is assigned tasks (user stories) that they will complete. They must focus on achieving these tasks within the time allotted, and must manage themselves to ensure they get the results required. These results are defined as specific success criteria for each task. Although each team member has their own tasks to focus on, the team must also help others complete their tasks by collaborating throughout the process. An Agile Marketing team is always focused on a collaborative effort. 1. What did you do yesterday? 2. What will you do today? 3. Are there any impediments in your way? The goal of each Standup is to help the team understand what everyone's working on, and how they can help to get things done collaboratively. It is very important that everyone who is working on the Sprint (especially the Product Owner and Scrum Master) to be present. Most Standup meetings actually take place with the team standing, so that everyone stays engaged and not get too comfortable. After a Sprint is completed, everyone meets to share what was done. This is also an expo for what new work is to come next, and help everyone stay on the same page. Once again the entire Scrum Team and stakeholders must be present. The Product Owner must identify what has (or has not) been done, and present a demo of current work completed, to be shown to the team. Any ideas or notes suggested, need to be recorded and added, or updated within the Product Backlog. The current state of the Product Backlog must also be discussed and understood for the next Sprint ahead. 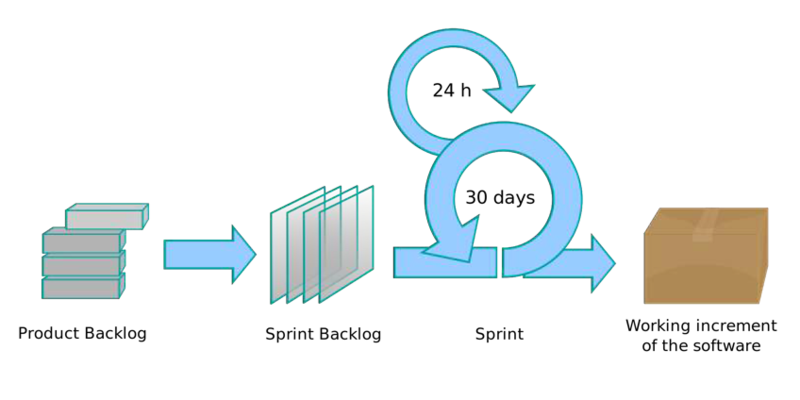 Similar to the Sprint Review, the Sprint Retrospective must occur after the Sprint has been completed. This meeting is different in that it is a discussion amongst the team and not simply a presentation by the Product Owner. At this meeting, the team discusses any ideas for future improvement, and acknowledges any team members who are worthy of recognition. It is important that whenever criticism is brought up, that there is an idea for improvement (so the mistake will not be repeated). Lastly, whenever an item is discussed the team should employ the ‘Five Why’s’ technique to ensure that the root cause is discovered and understood. To get started with Agile Marketing it is important that you have the buy-in from key stakeholders at your organization. Although the Agile process is a proven method for empowering your marketing team to become more efficient, it is an entirely new way of approaching project management to many people. It can be difficult to change how your organization operates. That’s why it is important to start small and grow your program over time, to get full buy-in and acceptance from the organization and marketing team as a whole. Often, the most successful approach, is for an individual to start using Agile on their own and prove it works. It’s a good idea to start with a small project that has a short timeline and is not critical (so you can try the process without becoming overwhelmed and abandoning the process as a result). If you can find allies who also share your enthusiasm for Agile Marketing, another approach is to start with a low risk pilot project first. No matter which scenario applies to you and your team, you should try to fully embrace the workflow from the start. That includes creating a backlog, managing your Sprints and having Standup meetings to tracking progress visually for the team (or yourself) to reference. One of the biggest challenges with using Agile Marketing is getting the momentum going where everyone feels comfortable with the process, and does not deviate from it. It is very important that everyone on the team follow the same set of rules equally. One key problem occurs in that the team will need to focus on learning a new methodology and process (while they do the work itself within its rules). It’s important not to overwhelm your team with too many new concepts at the same time, such as learning a piece of software (while learning Agile itself). Starting with a simple whiteboard, the entire team can share, is often the best way to start. Often problems arise when people who aren’t following the rules interfere with those who are. For example, if team members are not present for reviews (when they should be), or non-core team members consume a meeting with discussions that are not relevant, it won’t take long before people stop believing in the Agile process. In general, only team members with work assigned should ever be speaking at a meeting. Any topics outside of the three questions above should be addressed outside of a Standup meeting, and that goes for other Agile meetings as well (including Sprint Reviews and Sprint Retrospectives). It is important that teams report directly to other team members about their progress instead of privately to a single member or the Scrum Master. It is a key component of Agile, that everyone is on the same page at all times, and that time used for communication is kept brief and focused. Often within an Agile team (that is using the Scrum methodology), there is a leader called the Scrum Master. They ensure user stories are prioritized and that any items brought up during a retrospective meeting are documented. They look out for obstacles in the way of the Sprint, and ensure everyone on the team is aware of the goal, and are in sync for the expectations for each Sprint. Ultimately, the Scrum Master is the coach that ensures the team is working both independently and collaboratively, and that everyone is having a stress free experience. One of the tools a Scrum Master can use to bring their team together is a Kanban board (Figure 4). 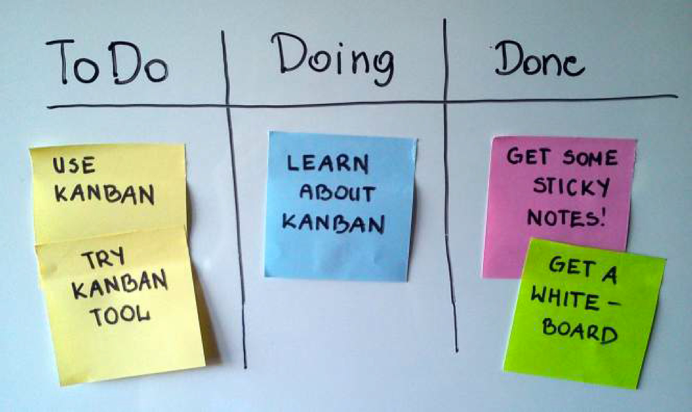 Kanban is another widely used method for organizing an Agile teams activity. Kanban is based on the Japanese strategy of ‘Kaizen’, which encourages teams to achieve continuous improvement incrementally, one step at a time. Kanban is often implemented as a whiteboard in a visual location within the office. It uses columns with different contexts within them such as: Not Started, On Deck, In Progress, In Review and Done. Team members use sticky notes and place their tasks on the board for everyone to see. As items are achieved they are placed in the ‘Done’ column. This method allows team members to understand where everyone's tasks are currently, and how they can help each other to achieve the Sprint as a team. It is important to state that Agile Marketing is more about focusing on the process itself, than any specific tool. As we shared, you can use a whiteboard to successfully implement an Agile process with your team using Kanban. That said, using digital tools and resources can be a powerful way to organize the work ahead and ensure everything related to your Agile Marketing effort is on track. Agile Backlog Tool: Organize your Product and User Story Backlog. User Story Prioritization Tool: Find the most useful user stories or tasks. Sprint Planning Tool: Plan and track what is involved within each sprint. Kanban Chart: Organize and visually show the context for tasks. Scrum Master Checklist: Quickly review how well your team is doing. Standup Checklist: Ensure your Standups do not meiss anything important. Sprint Review Checklist: Ensure your Review follows best practices. Sprint Retrospective Checklist: Ensure lessons learned are leveraged. If you are looking for a software solution that is Agile-friendly, sign up for a free 30-day trial with Demand Metric, which allows teams to use a digital Kanban board collaboratively.